(San Leandro, CA) — At one point, Mike “Tasty” McDole was just a mild-mannered homebrewer who stumbled into the universe of The Brewing Network, the premier multimedia website for brewers and beer lovers. A regular on the Network’s “Session” show, Tasty gained notoriety with advice to listeners that was 50% informative, 35% conversation and the remainder too inappropriate for this paragraph. 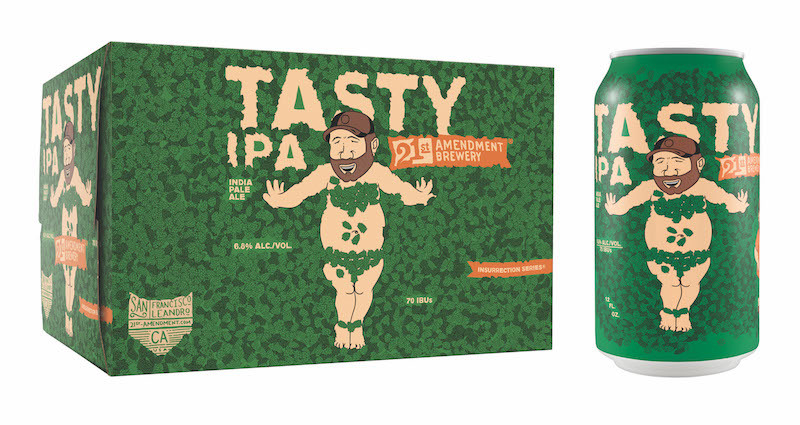 Today, Tasty’s legendary status among the craft beer community is trademarked by his award-winning homebrew recipes and his signature caricature sticker, which you’ll find affixed at nearly every good beer place around the country. And so with great pleasure, and McDole’s personal sticker of approval, 21st Amendment Brewery presents a delicious collaboration, Tasty IPA, a beer that is rooted in friendship, created for the common love of homebrewing and dedicated to the American beer beauty known as Tasty McDole. At 6.8% ABV with its straw color, Tasty IPA drinks easily but isn’t necessarily easy drinking. The hop forward creation, spawned from test batches of Tasty’s own homebrews, features Citra and Mosaic Lupulin Powder with Ekuanot hop pellets. Tasty IPA is 21st Amendment’s second Insurrection Series beer release of 2017, and in September a limited amount of this beer will be distributed nationwide, on draft and in six pack carriers. What’s more? Tasty IPA pairs with spicy foods, peach cobbler, cargo shorts and your favorite beer t-shirt. The can design features McDole lying in a bed of hops, inspired by the iconic fantasy scene in the movie “American Beauty,” and was drawn by Tasty’s son Mark McDole. It serves as a reminder to all homebrewers that dreams do come true, fantasies can become reality, and big burly beer dudes are a thing of beauty. “At the end of the day, we’re all just a collection of beer geeks having fun, doing what we love in this homage to the art of homebrewing,” added O’Sullivan. Six packs and draft of Tasty IPA will be available for a limited time in all 21A distribution markets including AK, CA, DE, FL, GA, ID, IL, MA, MD, ME, MN, NC, NH, NJ, NV, NY, OH, OR, PA, RI, SC, VA, VT, WA and Washington D.C. In 2000, Nico Freccia and Shaun O’Sullivan opened the doors to the 21st Amendment brewpub in San Francisco’s historic South Park neighborhood with Freccia managing the restaurant and O’Sullivan spearheading the brewing process. In addition to quickly becoming one of the city’s favorite pubs, 21st Amendment began expanding beyond the Bay Area by helping to pioneer the movement to canned craft beer. Known for their witty names and delicious brews, 21st Amendment offers year-round selections, as well as seasonal offerings and their ‘Insurrection Series’ of once-in-a-while limited edition release. Sold in 25 states, 21st Amendment operates out of its new San Leandro brewery headquarters and is among the top 50 craft beer brewers in America.